If you didn’t plant ’em, you’ve got to protect ’em. It happens to all of us. At least, it happens to me and a lot of other gardeners I know. 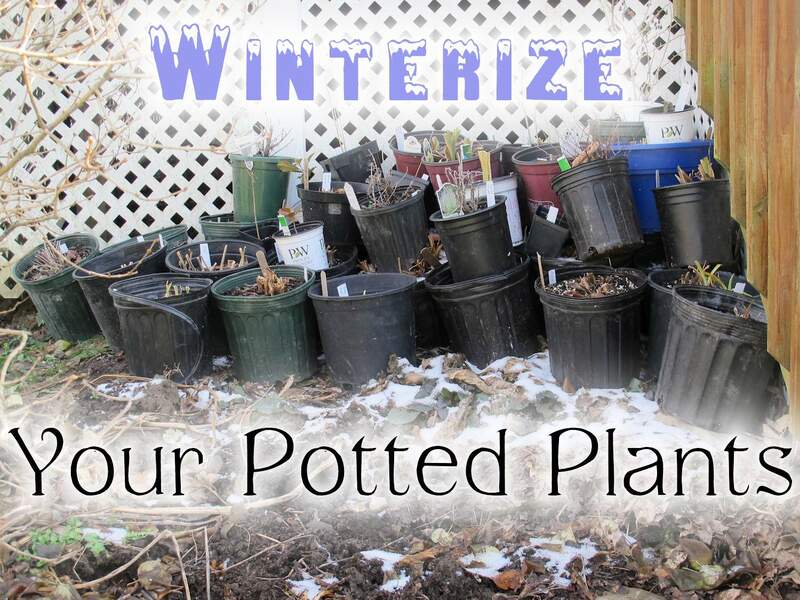 Winter is right around the corner and you have all these plants in pots that you were sure you were going to have time to plant during the growing season. And now the growing season is over and something must be done to get them through the winter, so that they can be planted in the ground next year. So what’s the big deal? Why not just leave them where they are and let them get snowed on? The roots of a plant in a container aren’t insulated from the cold as well as roots growing into the soil. A general rule of thumb is that a plant in a container needs to be two USDA hardiness zones hardier than the plants in the ground. So if the plants you have in containers are only as hardy as needed for your climate, they are not going to survive the winter unprotected. 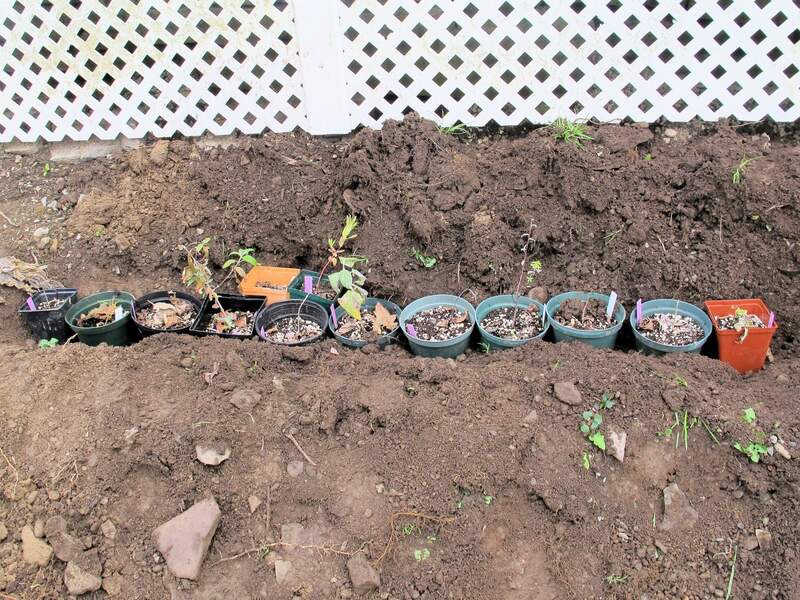 I am not talking about annuals–which we expect to die before winter–or tropical plants, such as dahlias and cannas–which must be dug and stored frost-free in order to survive–but perennials, small shrubs, and tree seedlings, which would do just fine had they been planted in the garden in a timely manner. The easiest way to solve this problem is to put those potted plants in a location that is two hardiness zones warmer than usual for you. An insulated garage or garden shed would suit the purpose. These big containers do not need the light, but the protection of the garage. 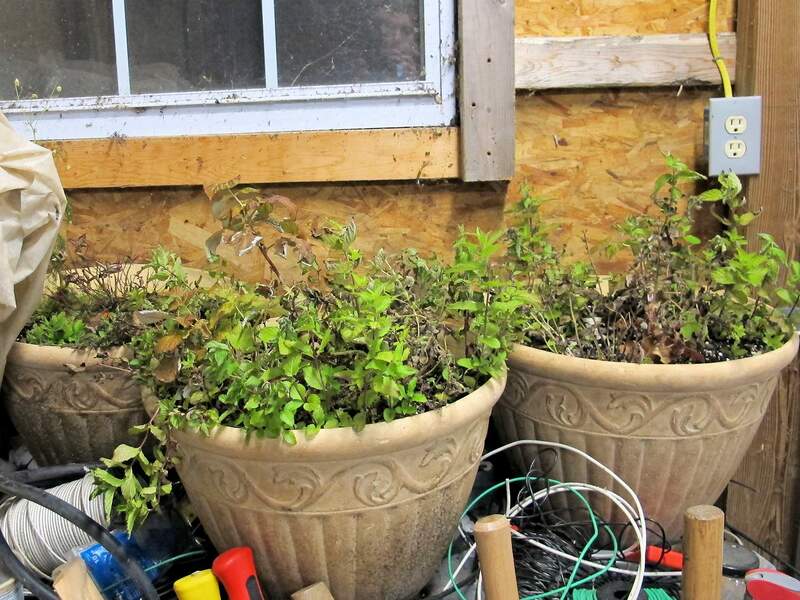 My detached garage is not insulated, but that’s where I’m storing three berry plants in large ornamental containers. Neither of the other methods will suit, in this case, so I’m crossing my fingers and hoping for the best. If they survive, you will hear all about it next spring. Margaret Roach is the only gardener I know who insulated her garage/shed expressly to winter over some plants in pots. 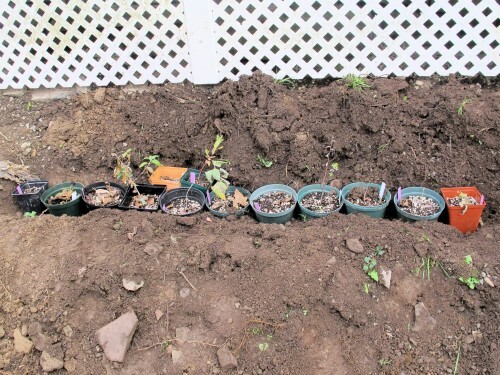 If you don’t have many container plants to protect, you could tuck them into some unused ground where a temporary hole would not be a problem. That way, their root balls would be protected by the surrounding earth without being disturbed by transplanting, when they are only going to be moved again come spring. Some people use a corner of their vegetable garden for this. I had a bunch of rooted shrub cuttings from a propagation workshop I had attended, and a big bare spot where an enormous barberry had been pulled out. 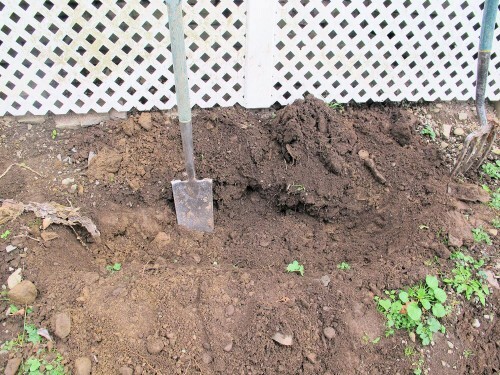 I dug a trench in the ground where an enormous barberry had been removed. 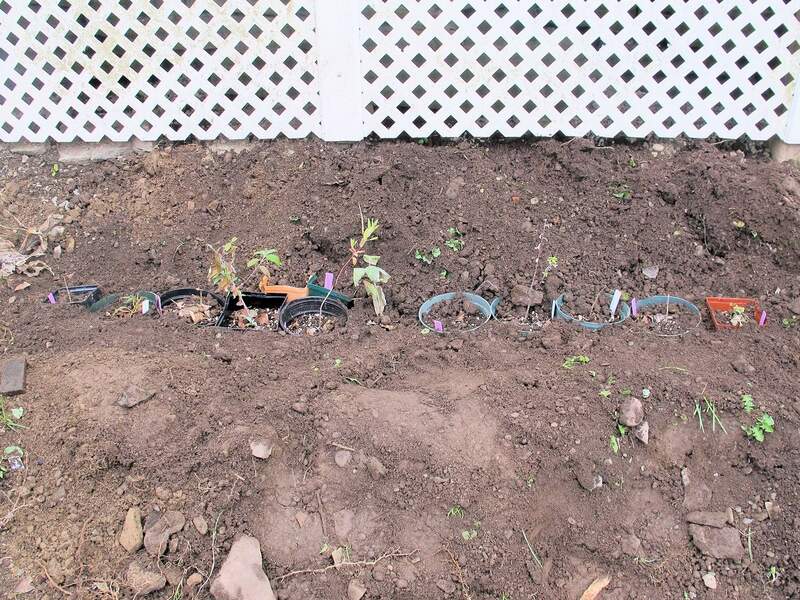 I placed the pots into the trench. 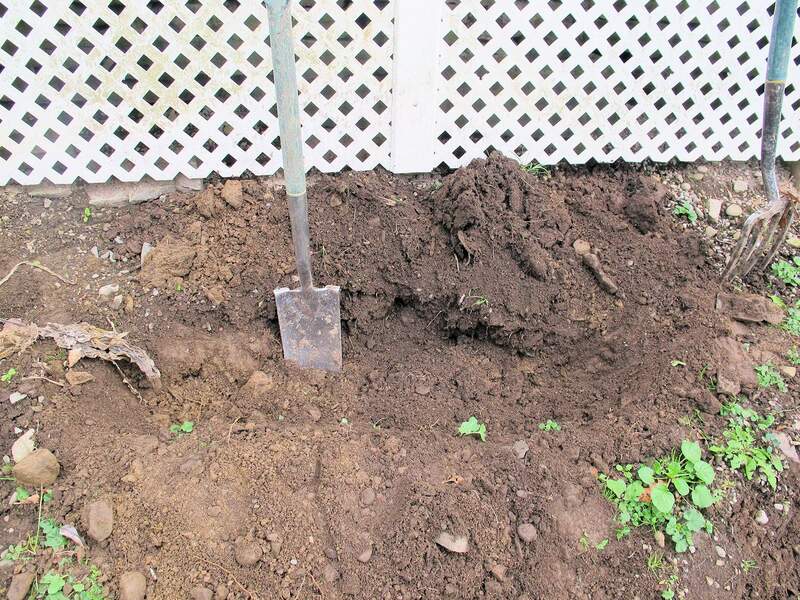 Then I backfilled soil into the gaps around the pots. For good measure, I tossed several inches of leaves over the top. But what if you have a lot of plants in pots? Like, say, forty-five? 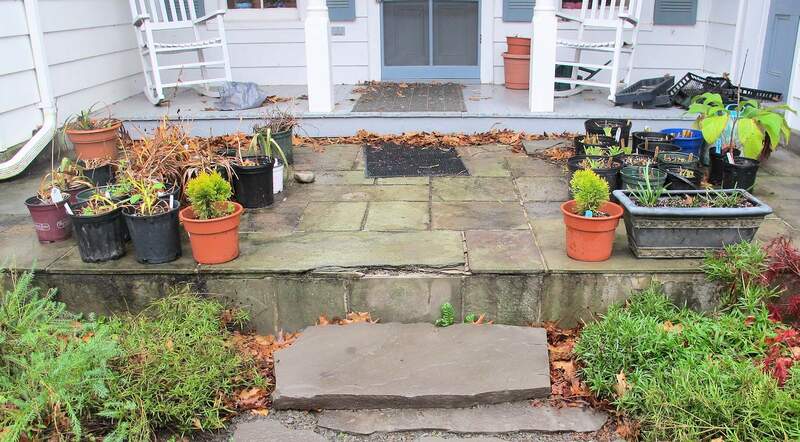 The plants on the right have been trimmed and all the weeds growing in their pots have been removed. The plants on the left are waiting their turn. For the last two years, I have placed a bunch of plants in containers in a sheltered corner and covered them with leaves. They have come through with only minor losses so I feel somewhat confident about sharing this method with you. (We haven’t had especially severe winters the last two years, which is why I am not wholeheartedly confident.) Faced with a large inventory that you wish to protect, you may not have any choice but to use this method. Try to find a corner of the house that faces north. Using a corner of the house provides some heat. 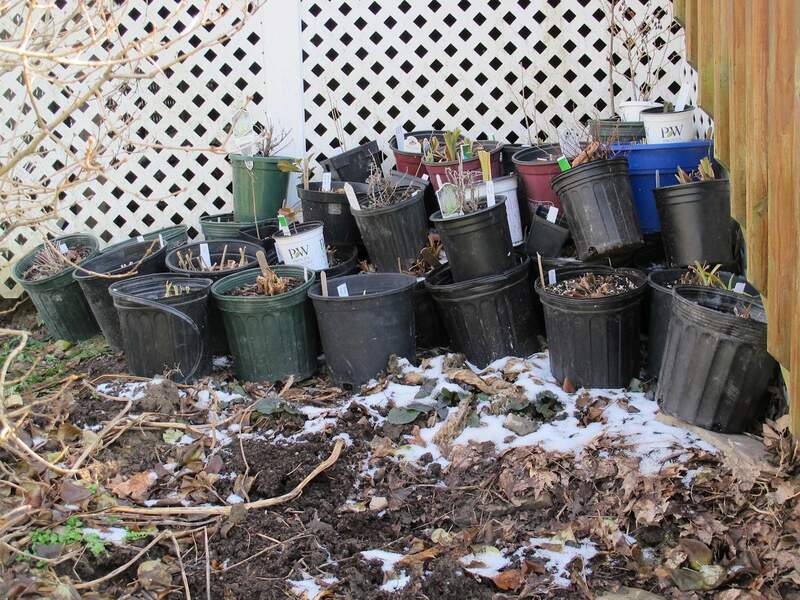 A north-facing location will stay out of winter’s occasional sunshine and not be as subject to thawing, which can bring a plant out of dormancy, making it more vulnerable to cold damage. First I placed the tidied-up, freshly labeled pots in the corner. Most of these plants had temporary wooden labels, because at the time I was certain that–unlike previous years–they would all be planted well before November. So before I stacked the pots, I relabeled them all with plastic labels. Mold grows on wooden labels, rendering them illegible after a time. For good measure, I wrote down each plant as I labeled it. (That’s why I know there’s forty-five pots stacked up there.) That way, this winter I can actually figure out where I’m going to plant them all in the spring. With the help of my 11-year-old offspring, I loaded leaves into my garden cart and took them to the back of the house. A lilac bush prevented us from getting all the way into this area and just dumping the leaves. So we stuffed them into tub-trugs and then poured them over the stack of potted plants. I made sure leaves got stuffed behind and in between the pots. We had to get three or four garden carts full to make sure they were all covered. The leaves completely cover the plants in pots, insulating them from the worst of the cold. 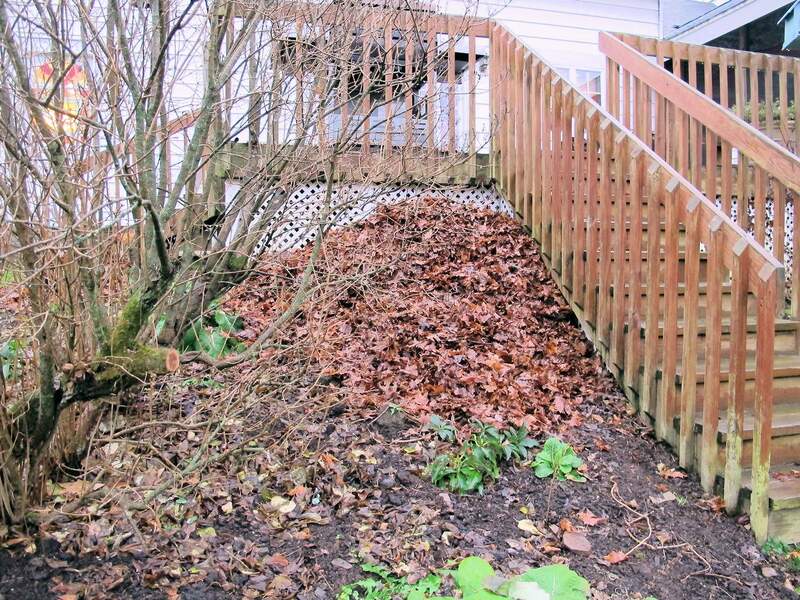 As you can see, this is not up against the house, but up against the lattice that skirts the deck and stairs. But I suspect it still gets some warmth from the house. Don’t the leaves blow away? It helps to set this up in a protected corner, but I do check on it every so often before we get our permanent snowpack. Once there is an accumulation of snow, the leaves don’t go anywhere. Even if the snow melts, it has usually packed down the leaves and the frozen moisture that has crept in kind of glues them together. When do you uncover them in spring? When I see perennials in the garden start to show new growth, I start to gradually remove the leaves from the pile, removing more each day. Sometimes I see etiolated growth snaking out from the leaves, and then I really know it’s time to uncover them. Do you have problems with rodent damage? Chipmunks and voles are prevalent in this area anyway, and I have found evidence of tunnels both in a few pots and in the ground at the bottom. But since most of them are trimmed close before storage, there isn’t much for them to eat except the roots. I think they actually tried to bury food in the pots, not eat the plants. There is a steady supply of bird seed for them to eat, so I don’t think they are really tempted. If you find yourself with an embarrassment of riches at the end of the growing season, give yourself permission to hide them under a pile of leaves. The plants in those containers will thank you for it! I also do the same thing for my potted plants so that the winter season won’t creep into them harshly. Great advice, Kathy. 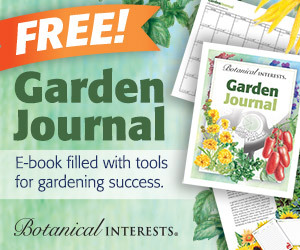 I have a potted fig stored in an unheated garage and potted hostas dug into the ground … these methods have worked repeatedly for me with these specific plants. This year, because I like to experiment, I opted to see just how hardy a ginger mint is. It’s placed in its pot against a stone wall collecting whatever leaves it can. I like all your suggestions and have tried most of them. My favorite thing to do in put them in the compost pile and put leaves on top of them. So far that has worked. But if I am being lazy and don’t care too much about the plant, I sometimes just leave it where I had meant to plant it. This spring, after a winter of such neglect, I discovered that this plant had rooted itself into the soil through the holes in the bottom of its plastic pot – but I guess I can’t always count on being so lucky! A friend divided and potted up a bunch of perennials for our big Bridge of Flowers plant sale next May and then fretted that they wouldn’t manage through the winter. They are now buried in my garden until spring arrives. I heard that if you potupf plants and bury them they do better and look better in the spring when plant sale buyers – or friends – will look at them with particular pleasure. 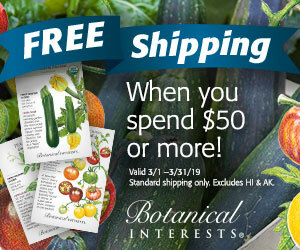 This just means that I could have ordered 45 plants on sale to overwinter! Such good ideas here. I was going to try to overwinter some of my water container (pond) plants in my shed but I chickened out and brought them down to our cellar. It gets really cold and windy here (Clayton, NY). Our cellar is stone so it stays cool and the plants have already gone dormant. We’ll see … So much to look forward to in spring! May your potted plants all survive, Kathy! The mention of using haybales and or netting to hold the leaves sounds like good advice, too. You have put a lot of effort into potting up and labeling, so taking the time to protect them well seems logical. Good luck and I look forward to hearing the results in spring. I often sink several pots in a temporary location for overwintering…. but I’ve never had 45!!! 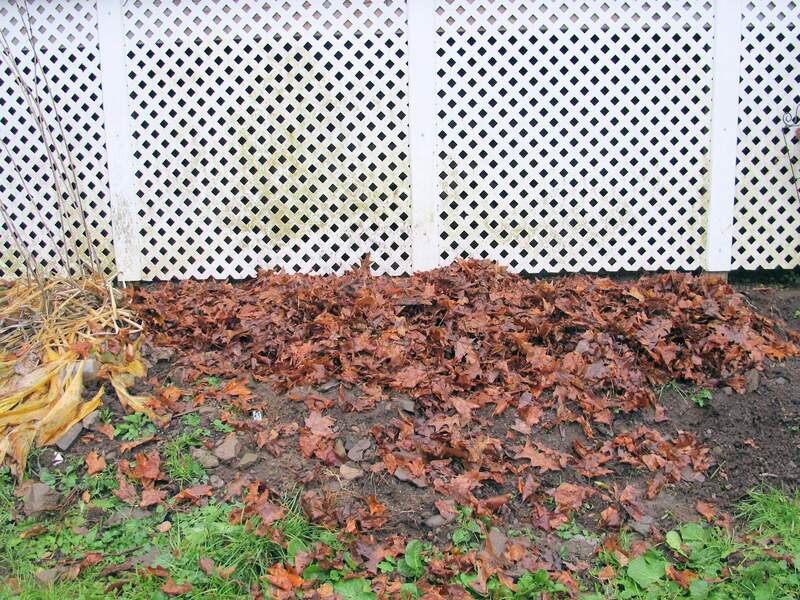 😉 There are times I purchase “deer netting” to stretch over a mound of leaves – or over mulch in open areas that are prone to wind. Really like your suggestions of bringing some things into the unheated garage. 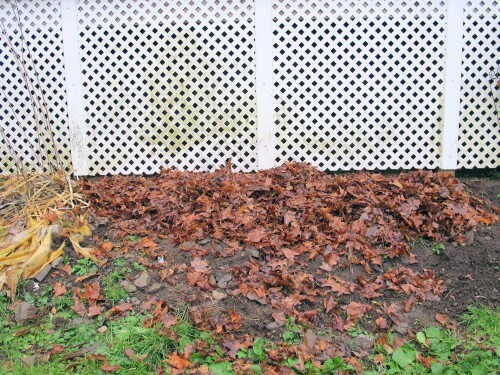 Using the deer netting to hold down leaves is a good idea, shady gardener. Thanks for the tip! P.S. I’ve never had 45 before, either! You’re welcome, Dee. Using hay or straw bales is another good idea. I’ve never had a bunch hanging around, so have yet to take that approach.